What is the DepEd K to 12 grading system? The K to 12 Basic Education Program uses a standards- and competency-based grading system. These are found in the curriculum guides. All grades will be based on the weighted raw score of the learners’ summative assessments. The minimum grade needed to pass a specific learning area is 60, which is transmuted to 75 in the report card. The lowest mark that can appear on the report card is 60 for Quarterly Grades and Final Grades. 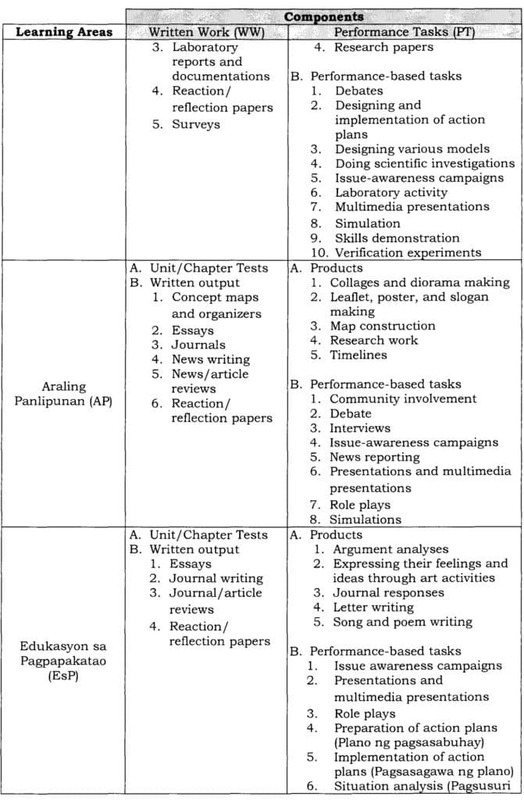 For these guidelines, the Department will use a floor grade considered as the lowest possible grade that will appear in a learner’s report card. 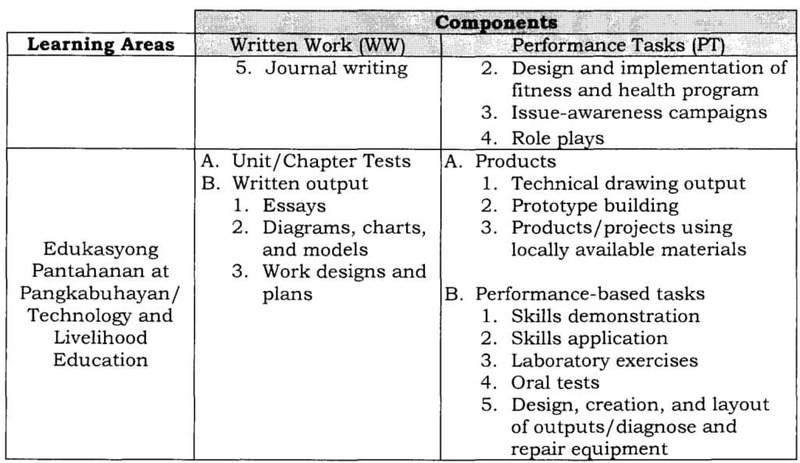 Learners from Grades 1 to 12 are graded on Written Work, Performance Tasks, and Quarterly Assessment every quarter. These three are given specific percentage weights that vary according to the nature of the learning area. How is learner progress recorded and computed? Guidelines specific to the assessment of Kindergarten learners will be issued in a different memorandum or order. However, for Kindergarten, checklists and anecdotal records are used instead of numerical grades. These are based on learning standards found in the Kindergarten curriculum guide. It is important for teachers to keep a portfolio, which is a record or compilation of the learner’s output, such as writing samples, accomplished activity sheets, and artwork. The portfolio can provide concrete evidence of how much or how well the learner is able to accomplish the skills and competencies. Through checklists, the teacher will be able to indicate whether or not the child is able to demonstrate knowledge and/or perform the tasks expected of Kindergarten learners. Through anecdotal records or narrative reports, teachers will be able to describe learners’ behavior, attitude, and effort in school work. In a grading period, there is one Quarterly Assessment but there should be instances for students to produce Written Work and to demonstrate what they know and can do through Performance Tasks. There is no required number of Written Work and Performance Tasks, but these must be spread out over the quarter and used to assess learners’ skills after each unit has been taught. The following are the steps in computing for the Final Grades. Step 1: Grades from all student work are added up. This results in the total score for each component, namely Written Work, Performance Tasks, and Quarterly Assessment. Raw scores from each component have to be converted to a Percentage Score. This is to ensure that values are parallel to each other. Step 2: The sum for each component is converted to the Percentage Score. Step 3: Percentage Scores are then converted to Weighted Scores to show the importance of each component in promoting learning in the different subjects. To do this, the Percentage Score is multiplied by the weight of the component found in Table 4 for Grades 1 to 10 and Table 5 for Senior High School. The product is known as the Weighted Score (WS). The grading system for Senior High School (SHS) follows a different set of weights for each component. Table 5 presents the weights for the core and track subjects. 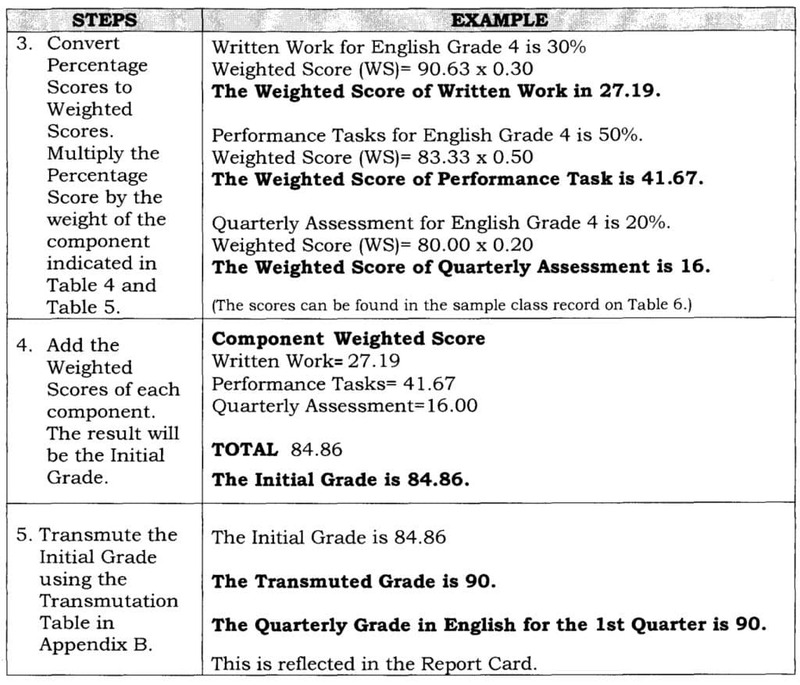 Step 4: The sum of the Weighted Scores in each component is the Initial Grade. This Initial Grade will be transmuted using the given transmutation table to get the Quarterly Grade (QG). Step 5: The Quarterly Grade for each learning area is written in the report card of the student. For a better understanding of how to record the summative assessments, Table 6 presents a sample class record showing three learners for the first quarter of Grade 4 English. On the basis of this class record, Table 7 presents a step-by-step process on how to compute for the Quarterly Grade. Get the total score for each component. Divide the total raw score by the highest possible score then multiply the quotient by 100%. Convert Percentage Scores to Weighted Scores. 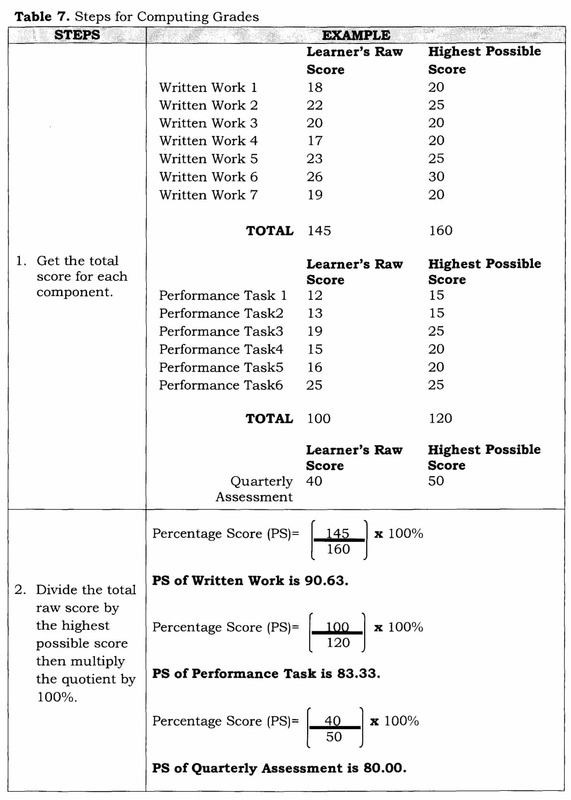 Multiply the Percentage Score by the weight of the component indicated in Table 4 and Table 5. Add the Weighted Scores of each component. The result will be the Initial Grade. Transmute the Initial Grade using the Transmutation Table. 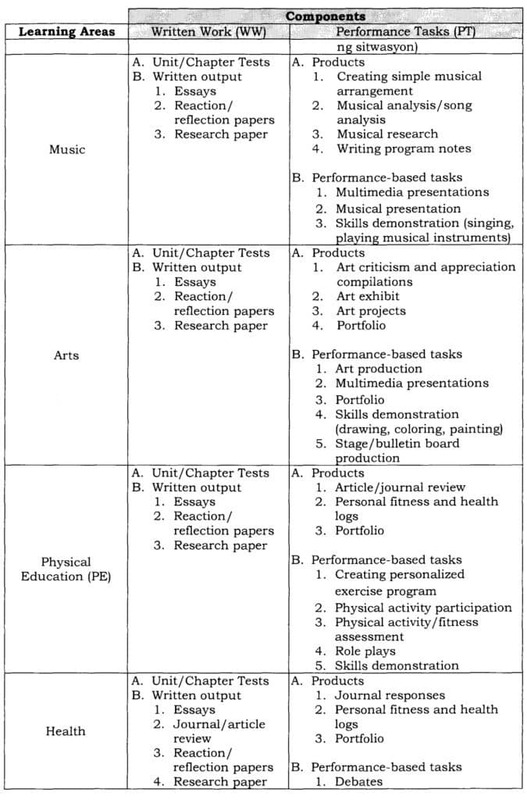 For MAPEH, individual grades are given to each area, namely, Music, Arts, Physical Education, and Health. The quarterly grade for MAPEH is the average of the quarterly grades in the four areas. How are grades computed at the end of the school year? There are no numerical grades in Kindergarten. Descriptions of the learners’ progress in the various learning areas are represented using checklists and student portfolios. These are presented to the parents at the end of each quarter for discussion. Additional guidelines on the Kindergarten program will be issued. The average of the Quarterly Grades (QG) produces the Final Grade. The General Average is computed by dividing the sum of all final grades by the total number of learning areas. Each learning area has equal weight. The Final Grade in each learning area and the General Average are reported as whole numbers. 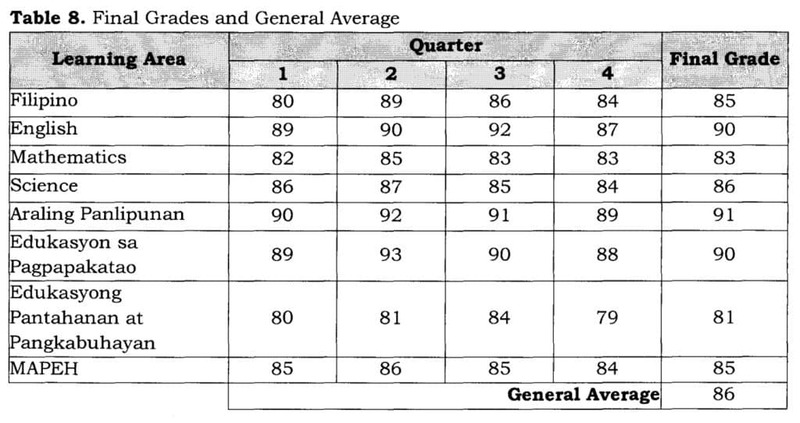 Table 8 shows an example of the Final Grades of the different learning areas and General Average of a Grade 4 student. The two quarters determine the Final Grade in a semester. 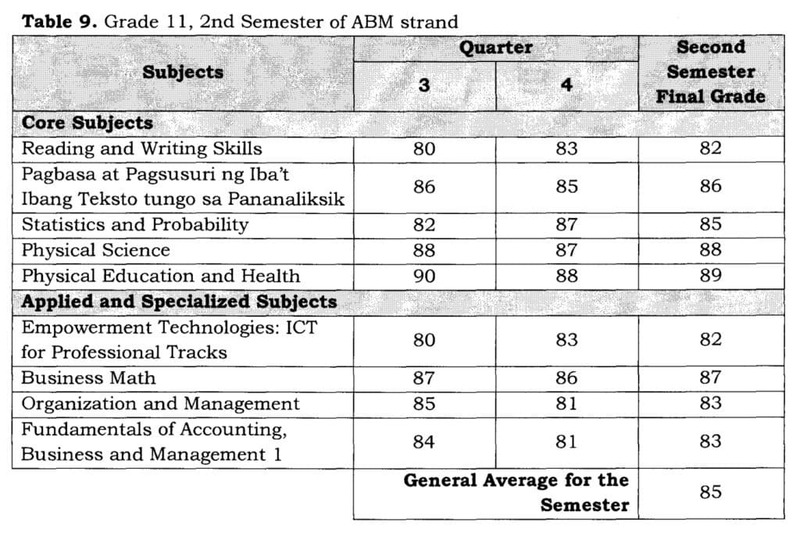 Table 9 shows an example in Grade 11, second semester for the Accounting, Business, and Management (ABM) strand. How is the learner’s progress reported? The summary of learner progress is shown quarterly to parents and guardians through a parent-teacher conference, in which the report card is discussed. The grading scale, with its corresponding descriptors, are in Table 10. Remarks are given at the end of the grade level. 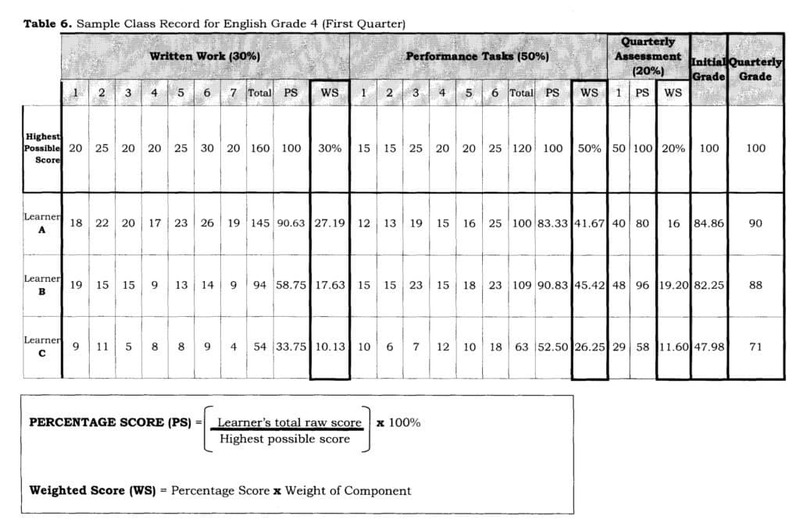 Using the sample class record in Table 6, LEARNER A received an Initial Grade of 84.86 in English for the First Quarter, which, when transmuted to a grade of 90, is equivalent to Outstanding. LEARNER B received a transmuted grade of 88, which is equivalent to Very Satisfactory. LEARNER C received a grade of 71, which means that the learner Did Not Meet Expectations in the First Quarter of Grade 4 English. When a learner’s raw scores are consistently below expectations in Written Work and Performance Tasks, the learner’s parents or guardians must be informed not later than the fifth week of that quarter. This will enable them to help and guide their child to improve and prepare for the Quarterly Assessment. A learner who receives a grade below 75 in any subject in a quarter must be given intervention through remediation and extra lessons from the teacher/s of that subject. How are learners promoted or retained at the end of the school year? This section provides the bases for promoting a learner to the next grade level or for retaining a learner in the same grade level. These decisions must be applied based on evidence and judiciously. A Final Grade of 75 or higher in all learning areas allows the student to be promoted to the next grade level. Table 11 specifies the guidelines to be followed for learner promotion and retention. Did Not Meet Expectations in not more than two learning areas Must pass remedial classes for learning areas with failing mark to be promoted to the next grade level. Otherwise the learner is retained in the same grade level. Did Not Meet Expectations in any subject or learning area at the end of the semester Must pass remedial classes for failed competencies in the subjects or learning areas to be allowed to enroll in the next semester. Otherwise the learner must retake the subjects failed. For Grades 1-10, a learner who Did Not Meet Expectations in at most two learning areas must take remedial classes. Remedial classes are conducted after the Final Grades have been computed. The learner must pass the remedial classes to be promoted to the next grade level. However, teachers should ensure that learners receive remediation when they earn raw scores which are consistently below expectations in Written Work and Performance Tasks by the fifth week of any quarter. This will prevent a student from failing in any learning area at the end of the year. For Grade 11-12, learners who fail a unit/set of competencies must be immediately given remedial classes. They should pass the summative assessments during remediation to avoid a failing grade in a learning area/subject. This will prevent students from having back subjects in Senior High School (SHS). However, if the learner still fails remedial classes, s/he must retake the subject/s failed during the summer or as a back subject. Guidance teachers/career advocates must provide support to the SHS student for his/her choices in SHS tracks. Summative Assessments are also given during remedial classes. These are recorded, computed, weighted, and transmuted in the same way as the Quarterly Grade. The equivalent of the Final Grade for remedial classes is the Remedial Class Mark (RCM). The Final Grade at the end of the school year and the Remedial Class Mark are averaged. This results in the Recomputed Final Grade. If the Recomputed Final Grade is 75 or higher, the student is promoted to the next grade level. However, students will be retained in the grade level if their Recomputed Final Grade is below 75. 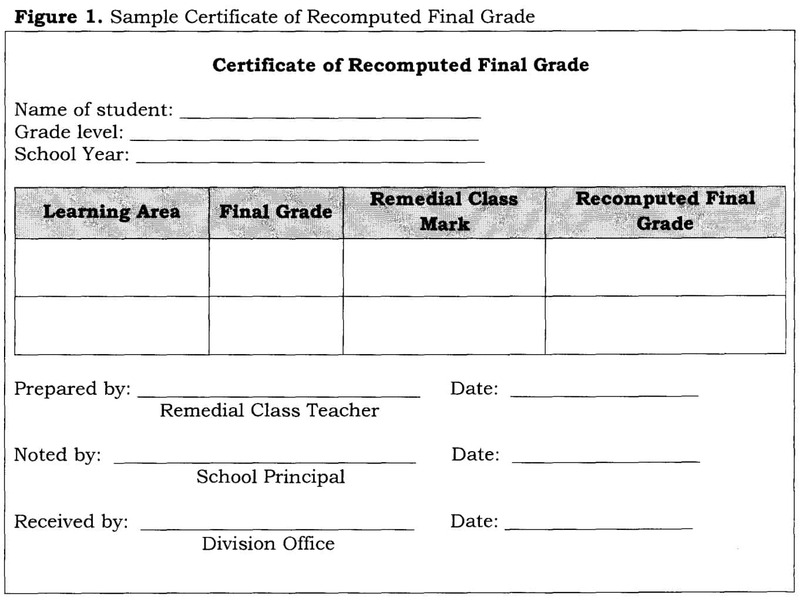 The teacher of the remedial class issues the Certificate of Recomputed Final Grade, which is noted by the school principal. This is submitted to the division office and must be attached to both Form 137 and School Form Number 5. Figure 1 below shows a sample certificate. The learner can enroll in the next grade level for Grades 1-10 and in the next semester for Grades 11-12 upon presentation of the Certificate of Recomputed Final Grade. This certificate can be verified in the division offices as needed. How are the Core Values of the Filipino child reflected in the Report Card? The goal of the K to 12 curriculum is to holistically develop Filipinos with 21st-century skills. The development of learners’ cognitive competencies and skills must be complemented by the formation of their values and attitudes anchored on the Vision, Mission, and Core Values of the Department of Education (DepEd Order No. 36, s. 2013) as shown on the next page. Non-DepEd schools may modify or adapt these guidelines as appropriate to the philosophy, vision, mission, and core values of their schools. As a learner-centered public institution, the Department of Education continuously improves itself to better serve its stakeholders. The Core Values have been translated into behavior statements. In addition, indicators have been formulated for each behavior statement. These are presented in Table 12. Schools may craft additional indicators for the behavior statements. Schools must ensure that these are child-centered, gender-fair, and age- and culture-appropriate. To support the development of these Core Values, schools must make sure that their homeroom guidance program promotes them. Additional opportunities may be integrated into class discussions in all learning areas. A non-numerical rating scale will be used to report on learners’ behavior demonstrating the Core Values. The Class Adviser and other teachers shall agree on how to conduct these observations. They will also discuss how each child will be rated. Table 13 presents the marks that must be used. Learners who demonstrate behaviors that are not consistent with or do not reflect the core values may need additional psychosocial support from the school. The class adviser should discuss these observations with the parents/guardians to promote the child’s affective development. Further probing may be needed to better understand the learner’s situation and context. It is important for learners to be in school every day. Learners’ class attendance shall be recorded by teachers daily. At the end of each quarter, the attendance is reflected in the report card. The number of school days in each month is presented, which is based on the school calendar for a given school year. The number of days that each learner is present and absent is indicated. Recording of attendance is done from Kindergarten to Grade 12. Table 14 shows how attendance is recorded at the end of the school year. A learner who incurs absences of more than 20% of the prescribed number of class or laboratory periods during the school year or semester should be given a failing grade and not earn credits for the learning area or subject. Furthermore, the school head may, at his/her discretion and in the individual case, exempt a learner who exceeds the 20% limit for reasons considered valid and acceptable to the school. The discretionary authority is vested in the school head, and may not be availed of by a student or granted by a faculty member without the consent of the school head. Such discretion shall not excuse the learner from the responsibility of keeping up with lessons and taking assessments. When absences cannot be avoided, the school must give the learner alternative methods and materials that correspond to the topics/competencies that were or will be missed. These include modules and materials for the Alternative Delivery Mode, and/or Alternative Learning System as well as those that are found on the Learning Resources Management and Development System (LRMDS). When students successfully accomplish the learning activities through these materials, they shall be exempted. However, the report card should still reflect the number of absences. Parents of learners who are accumulating many absences must be immediately informed through a meeting to discuss how to prevent further absences. Habitual tardiness, especially during the first period in the morning and in the afternoon, is discouraged. Teachers shall inform the parents/guardians through a meeting if a learner has incurred 5 consecutive days of tardiness. To whom is classroom assessment reported? Classroom assessment serves to help teachers and parents understand the learners’ progress on curriculum standards. The results of assessment are reported to the child, the child’s remedial class teacher, if any, and the teacher of the next grade level, as well as the child’s parents/guardians. 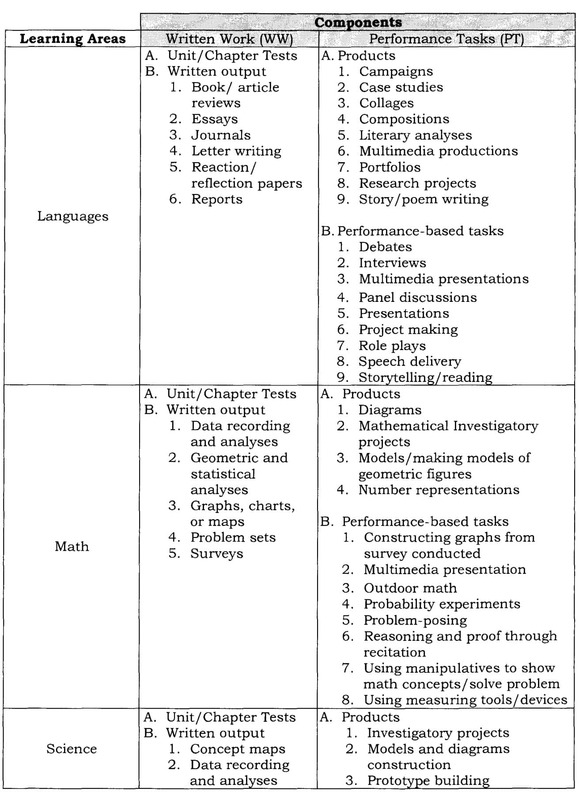 Below is the list of sample summative assessment tools per learning area. Teachers may use other appropriate tools specific to the assessment task. hello po! Inquiry lang po regarding sa pag compute ng grades sa SHS graduating students ranking of honors. Ang grades ba na nakuha ng student noong Grade 11 pa sya ay kasama pa din sa pag compute ngayong gaga-graduate na ng Senior High School (Grade 12)? Salamat po.